Grace Ross Hannay was born on September 13, 1831, in Glasgow, Lanark, Scotland to Professor Alexander John Hannay and Marion McDowell Hannay. She married William Halliday Lidderdale in 1858. Grace Ross died in 1904. They had two children, both born in Kelton, Kirkcudbright: James Halliday, born 1862, and a daughter Alexa Marion, born January 6, 1865. James Halliday died at age 3 the same year Alexa Marion was born. Source: Robert Halliday Lidderdale, An Account of the Lowland Scots Family of Lidderdale, 1950. Lidderdale memorial wall at the cemetary at Kelton, Scotland. William Halliday Lidderdale. Above named, the eldest son of the said James Lidderdale and Jane Hannay. 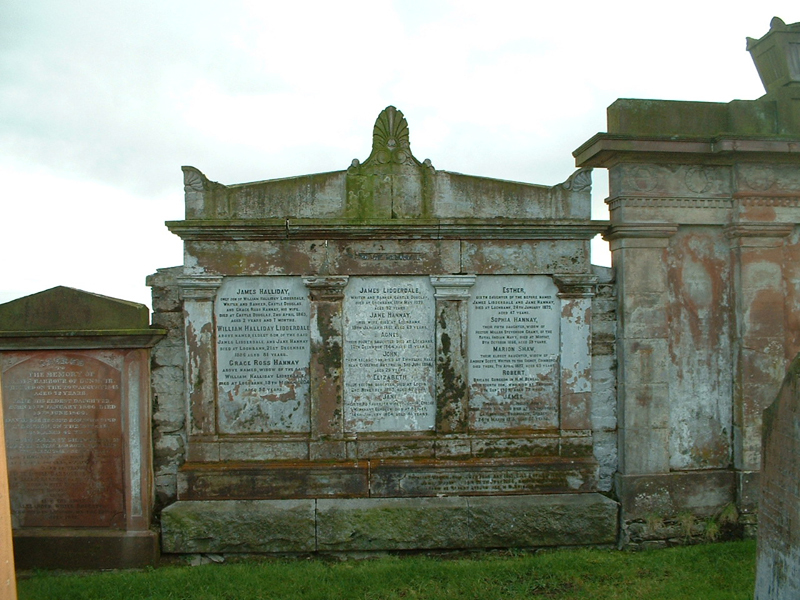 Died at Lochbank, 21st December, 1896, aged 81 years. Grace Ross Hannay. Above named. Widow of the said William Halliday Lidderdale. Died at Lochbank 13th March 1904, aged 73 years. Photo courtesy of Della Makinson.